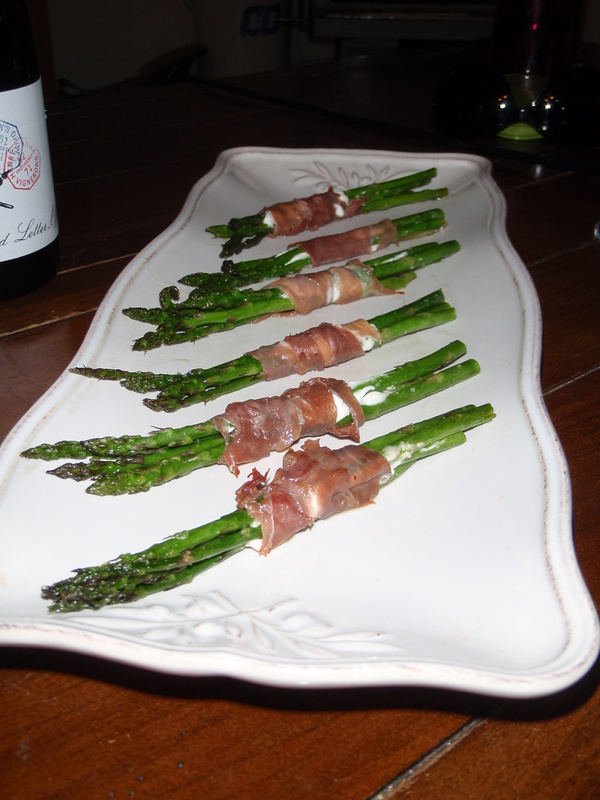 This delightful spring appetizer or hors d’oeuvre is terribly easy to make and requires only four ingredients; asparagus, goat cheese, prosciutto, and olive oil. First, preheat your oven to 450°F. Then take your asparagus and cut off the tough base, you can use 3-4 baby/skinny asparagus or one large asparagus. Next, top w/ a dollop of approx half a tbsp of goat cheese, marscapone, cream cheese, or whatever cheese you happen to have around and feel like using. Now wrap all of this in your prosciutto or Serrano ham. Drizzle with a bit of olive oil and bake for 5-15 min, it just depends on what size asparagus you are using. This dish is best served hot, but is still tasty at room temp. I would suggest another type of cheese that is creamy, like mascarpone or cream cheese. If you want a substitute for goat cheese in a recipe that requires a crumbly cheese, maybe go with feta. Let me know which cheese you choose and your results!